High-yielding Royal Dutch Shell is making big changes; investors shouldn't buy in with the wrong impression of what's going on. This article was updated on October 8, 2017, and originally published on March 29, 2017. Royal Dutch Shell plc (NYSE:RDS-A) (NYSE:RDS-B) has an enticing 6.2% yield, more than enough to lure in dividend investors. There are some very good things going on at the oil and natural gas giant, too. But before you buy, you have to step back and look at the big picture. If you don't, you could end up owning something you didn't expect. Here are three terrible reasons to buy Royal Dutch Shell. OK, let's be honest, the big yield is a great reason to buy Shell. But not without putting it into context. For example, Shell hasn't increased its dividend in three years. In fact, in an effort to protect cash flow, the company is offering a scrip dividend, which pays shareholders in stock so it doesn't have to pay in cash. This relates back to the steep decline in oil prices in mid-2014, but the roughly $50 billion acquisition of BG Group in 2016 is another important factor. That move increased the company's long-term debt by more than 50% between year-end 2015 and year-end 2016. Shell is now planning on selling $30 billion worth of assets to get its balance sheet back in order. In other words, Shell has a big yield, but there are risks you have to understand before you jump aboard. I believe it will be able to hold the line on the dividend, but until the balance sheet is in better shape, dividend increases, at least material ones, are probably on hold. Another thing you have to understand about Shell is that it's not your typical oil major... at least not after the BG acquisition. I'm not going to suggest that oil isn't important to Shell; it's still a major part of the business and an important growth engine for the company. But BG was a natural gas-focused company and a big reason Shell bought it was to make a strategic shift toward that fuel. And, to be honest, Shell was already among the largest players in the natural gas space, notably including liquified natural gas (which is how the fuel is transported when pipelines aren't an option). The BG acquisition made Shell an even bigger player in natural gas. Image source: Royal Dutch Shell plc. This is a long-term shift toward a fuel that is expected to foster the transition from carbon fuels to clean power, like solar and wind. Strategically, it's a solid decision and helps to underpin the company's growth plans, but you can't buy Shell thinking that it's just an oil company. Because it's increasingly looking like a natural gas company, too. Despite a long and successful operating history, Shell is a commodity company. That said, oil prices have bounced back from their early 2016 lows, which may lead some investors to call an all-clear. 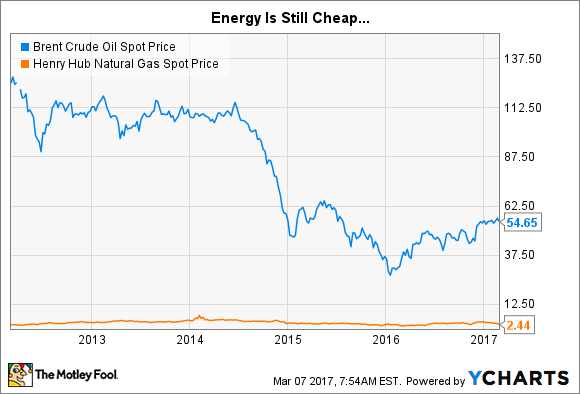 After all, if the pickup in drilling in the United States is any indication, things are looking up for energy companies. Some perspective is needed. Indeed, while oil prices have come off their lows, they remain far below the highs reached in 2014. And natural gas continues to trade at a relatively low price, historically speaking. That means there's not going to be a return to the salad days anytime soon. And the U.S. oil and gas activity could actually be part of the problem, as production here is flexible enough to ramp up and down quickly. Which is why U.S. onshore activity is expected to restrain energy prices. A new normal with lower energy prices is more likely than a steady rise at this point, limiting upside in Shell's earnings. There are a lot of good reasons to like Shell, including its push toward natural gas and debt repayment efforts. However, you have to understand the impact of these moves, as well as the bigger picture for the energy industry, where $100-per-barrel oil prices appear to be a thing of the past for now. As long as you have the bigger picture in focus, Shell is a solid option for dividend investors.